For the last few years of debate around the issue of high-speed rail, grade separating the peninsula rail corridor was often cast as an all-or-nothing proposition. This extremist view clouded two important facts: first, the corridor is already mostly grade-separated (in 2013, only 40 road crossings out of 104 between San Francisco and San Jose will remain at grade); and second, grade separation is a slow and inexorable process that takes place over many decades. Phase I is simply the completion of the San Bruno grade separation in 2013. The San Mateo / San Bruno grade crossing being replaced was once rated #7 statewide on the CPUC's priority list. 25th Ave in San Mateo, the only grade crossing that remains between San Mateo and Redwood City. Along with new grade separations already planned at 28th and 31st, this project enables the future 4-track mid-line overtake. Broadway in Burlingame, an extremely congested crossing that has been slated for grade separation since the 1970s. It rates #11 statewide on the latest CPUC priority list. Linden Ave in South San Francisco, originally planned as part of the San Bruno project, but dropped from the final design in 2007. Grade-separation at Linden is accompanied by the closure of Scott St, which becomes a pedestrian tunnel. Center Street in Millbrae, a grade separation that will require a U-shaped elevated ramp due to the nearby BART subway tunnel box. Such are the consequences of bad planning. Each of these projects is independent and can be negotiated on a case-by-case basis with the four affected cities. Starting in San Mateo County allows at least another decade for the Pacheco vs. Altamont debate to run its due course, legally and politically; these four projects are useful either way. Together, these six projects create a new 16-mile stretch of track that is entirely free of grade crossings. The corridor is now left with just three dense clusters of grade crossings, in San Mateo / Burlingame, Redwood City, and PAMPA (Palo Alto - Menlo Park - Atherton), highlighted in orange in the figure below. Note that these three dense clusters contain 27 crossings, and that to get this far, only 12 existing crossings were newly separated. Phase IV is the Great Redwood City Grade Separation. This project, potentially for the early 2030s, would prolong the four-track mid-line overtake by three miles, by removing six grade crossings in downtown Redwood City. Removing this cluster first makes sense from the standpoint of increased corridor capacity, the lowest number of new structures, the short mileage, and the entire project being politically simplified by virtue of its containment within Redwood City limits. Phase V is the Great San Mateo / Burlingame Grade Separation. This is a tougher project because it involves some of the most highly constricted portions of the corridor. It also involves political and technical coordination between two neighboring cities, adding an additional challenge. The sheer quantity of crossings (13 grade crossings + 4 obsolete grade separations within 2.4 miles) is also a complicating factor. Phase VI is the Great PAMPA Grade Separation. This project is left for last because it lies in the most expensive real estate on the corridor, involves coordination between three different cities, and is liable to cause the fiercest political and legal backlash anywhere on the peninsula. Delaying it until last, perhaps into the late 2030s, allows the customarily long planning process to run its course without undue haste in all three affected communities. We didn't arrive at today's state of grade separation (more than half) overnight. It resulted from a slow and steady process that began in earnest in the 1940s. The future is likely to be similar, and the peninsula rail corridor can reach a far improved state by separating just 12 more crossings over the next couple of decades, as described in Phases II and III. This dozen should be prioritized for construction, before any of the crossings in the remaining dense clusters are touched. Many words have been used to describe the myriad reasons why island platforms are best, and why express train traffic should be on the outside pair of tracks. To amplify those points, here is a picture of what a Caltrain station could be. In a true public transit system, trains and buses should connect seamlessly. Anyone who has transferred between Caltrain and buses knows that the transfer is rarely direct; it usually involves a circuitous path on foot, occasionally requiring an umbrella, followed by a slow bus ride around a bunch of convoluted islands that are often configured opposite to the bus' main direction of travel. Combine that with irregular timetables that are poorly adhered to, and what you've got is a time-wasting, ridership-killing mess of a connection. Since our previous coverage of Transbay, a gigantic hole has been dug where the old Transbay Terminal used to be. That's the part you can see. Behind the scenes, design of the yet-to-be-funded DTX (Downtown Extension) from 4th & King to Transbay continues. Millions have been spent to bring the design up to "30% engineering" where the details of tracks, stations, and tunnels have been sufficiently defined, down to the inch, to support construction bids and final design. The TJPA was kind enough to share the latest overview engineering drawing (PDF file) with Friends of Caltrain. This drawing is marked 'preliminary'. Sadly, it does not reveal any substantive changes since 2009, and the DTX remains the same slow, 35 mph conflict-ridden mess that it was then. Where previously it might have earned an overall grade of D, we'll give it a C-minus. Some improvements were made around the margins, but certainly nowhere near what it could be. Let's take a closer look. In the TJPA drawing, the Mission Bay station (built underground and alongside the existing 4th & King terminal) is laid out as in the diagram below. Inbound traffic comes from MT2 (Main Track 2) and exits on MT5 or MT2, and outbound traffic comes from MT4 or MT2 and exits on MT4. If we assume that MT4, MT2 and MT5 from a three-track tunnel that feeds the six-track Transbay Transit Center (TTC), we have 3 x 6 = 18 possible routes from the DTX tunnel to the TTC platform tracks numbered T21 through T26 from south to north. Each of these 18 routes through the interlocking (also known as the "throat" of the station) is labeled by a single letter at the entrance and the exit. In this context, a route is one particular alignment of the tracks, established in the anticipation of a train using it to traverse the interlocking from one track to reach another. Without getting into expensive simulations, a complex interlocking can be analyzed using a route locking table. All table elements representing routes that lock each other (converge, diverge, or cross--i.e. conflict, and cannot be simultaneously set without risking a collision) are marked with an 'X'. 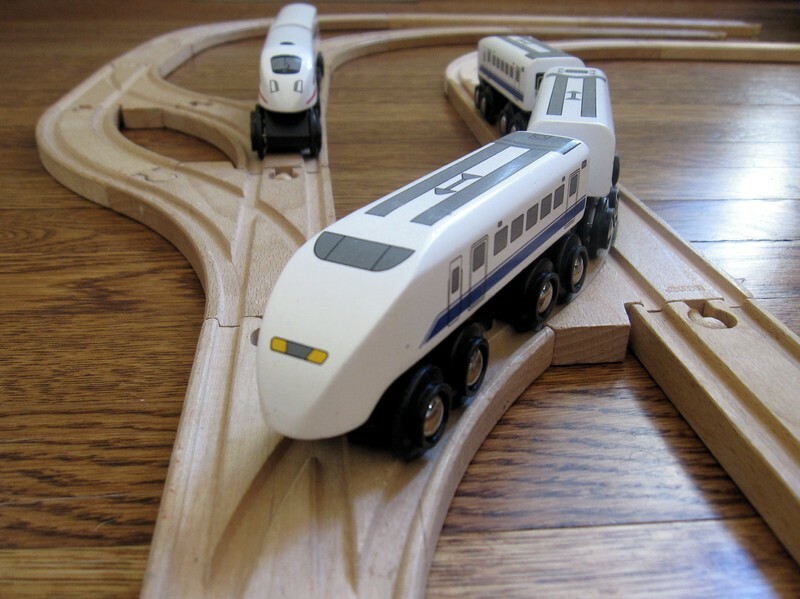 To evaluate the performance of the DTX track layout as proposed, we need to compare it to the ideal case, a track layout that cannot be improved upon because it has the fewest possible route conflicts. If we assume that the entire facility must remain on one level (with no tracks passing over or under each other) then conflicts necessarily occur between any route that crosses over another, for example routes f and m in the diagram above, or routes that share a portion of track, such as m and n. By inspection of the diagram, we can construct the ideal route locking table below. This is the most conflict-free this interlocking design can ever be, and illustrates why stub terminals are avoided whenever possible. 234 out of 324 possible routes (72%) conflict with each other at best, so we would like a Transbay design that doesn't make an already bad situation even worse. The route locking table can be improved (representing the pros and cons of various layouts more realistically) by weighting each route combination by the number of trains it carries, because we don't care if seldom-used routes happen to conflict. Instead of filling each cell of route locking table with an 'X', we compute a weight that represents the relative frequency of route combination a,b as n_a * n_b / N^2, where n_a is the number of trains using route a, n_b using route b, and N the total number of trains. 6 outbound HSR (again with 2 dead-head moves), 4 of which use MT4 and 2 use MT2 to overtake Caltrain at Mission Bay. Out of those 6 x 4 = 24 movements per peak hour, ten use MT5, four use MT2, and ten use MT4. Distributing that traffic to the corresponding platforms, we obtain the traffic-weighted route locking table for the "ideal" interlocking, subject to non-ideal platform segregation per TTC plans. Because of this segregation between HSR and Caltrain platforms, each route is used exclusively by HSR (shaded in blue) or exclusively by Caltrain (shaded in yellow). The sum of each row or column is a measure of how conflict-prone each route is. It comes as no surprise that the worst actors are routes q and r (because of high outbound Caltrain traffic) as well as e and f (because Caltrains inbound on MT5 must cut across the entire interlocking to reach their assigned platforms). 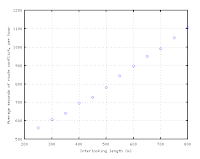 The 0.70 route locking rate means that two typical routes through the interlocking will conflict 70% of the time. This implies the best Transbay track layout that can ever be designed will allow two trains to simultaneously move into or out of the station without regard to each other only 30% of the time. Timetable planners and dispatchers will have their work cut out for them even on a good day. The dotted lines show two curved 'emergency' crossovers, known as XO-201 and XO-202, that were provided in response to Caltrain's request for emergency operational capacity. They will be used only when a failure occurs, and not during normal operations. Without those crossovers, Caltrain was one failure away from total shutdown. What immediately jumps out to a casual observer is that each pair of platform tracks (T21-22, T23-24, T25-26) necks down to a single turnout, preventing simultaneous routes from being established on both sides of the same platform. By inspection of the DTX layout, one can draw up the traffic-weighted route locking table below. The cells highlighted in orange are those that differ from the ideal layout discussed previously. The route locking rate has increased, to 0.75. The unused emergency crossover XO-202 single-handedly accounts for 0.03, the lion's share of the increase. The free-route rate of 0.25 is down from 0.30 in the ideal case; in other words, the probability of a conflict-free route is 17% lower than for the ideal layout. For an already constrained and inherently conflict-prone stub terminal, it is unacceptable to make traffic jams even worse than they need to be, and yet that is precisely what the proposed DTX track layout will do. The simplest improvement to be made is to add crossovers in the curved throat where the DTX enters the train box, to enable simultaneous and conflict free movements to/from opposite sides of the same platform. This achieves the lowest-possible route locking rate. The Caltrain curved crossover, XO-202 connecting tracks T25 to T24, is the most important one of these and needs to become part of normal operations. Two more curved crossovers need to be added to allow simultaneous movements to reach HSR platforms. The three missing crossovers are shown below. Better yet, the Caltrain and HSR platforms should be desegregated to give dispatchers the flexibility to avoid conflicts when they do threaten to arise. The route locking table gives the likelihood that any two randomly selected routes will conflict, but if a dispatcher can send a train to any platform or track, such conflicts can be avoided completely. Route conflicts are one problem, but not the only problem with the DTX design. When a train occupies the station "throat" interlocking, the duration of that occupancy must be minimized so that those conflicts that do inevitably arise (especially during off-timetable situations) are as short-lived as possible. This conflict duration depends on the signaling system (through such parameters as route setting time, signal watching time, approach time, clearing time, and release time), and also on the time when the train physically occupies the interlocking. This we can do something about; it is related to the length of the train, its speed, and the length of the interlocking. As currently designed, the throat interlocking extends over a considerable distance from the TTC train box all the way down to Bryant Street. The November 2012 plans show the interlocking stretching from STA 148 to STA 173, a length of 2500 ft or 750 meters. The speed is constrained at both ends, 35 mph at the south end and 22 mph into the train box. We can take 29 mph or a nice round 13 m/s as a realistic average speed through the interlocking. The physical occupancy time for one train is equal to (train length + interlocking length) divided by speed. To this we can add 30 seconds of route clearing/setting time, and 30 seconds of approach time after the route has been set but before the train enters the interlocking. For example, a 400 meter train moving at 13 m/s through a 750 meter interlocking will tie up a route for (400 + 750) / 13 + 30 + 30 = 148 seconds. Using the assumed traffic levels as well as train length parameters below, we can run a simple randomized trial to quantify the relationship between throat length and the cumulative duration of route conflicts. For each trial, the timing of train arrivals / departures is randomized over one hour (admittedly a worse assumption than reality, where conflicts are avoided by adhering to a timetable) and the total duration of conflict between routes is computed, after applying the route locking factor to account for routes that are mutually compatible. 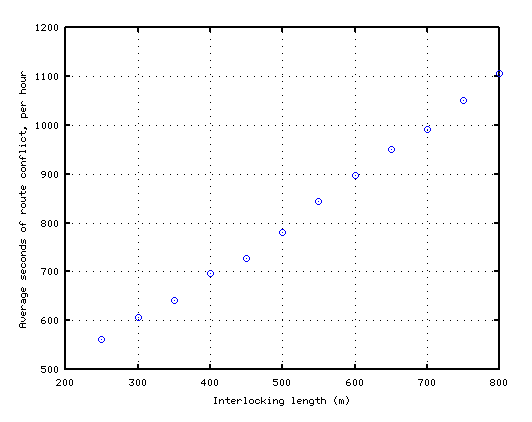 As can readily be observed in the graph at left, the relationship between the typical cumulative duration of conflicts and the length of the interlocking is strong, which implies that making the interlocking as short as possible will (a) facilitate the construction of a workable blended timetable by allowing closer spacing between train movements, and (b) facilitate timetable recovery after something goes wrong by reducing the cascading effect of delays in the station throat. Note that things will get exponentially worse if traffic increases, as it may in the long-term horizon beyond the blended system. As currently designed, the layout of the Transbay interlocking betrays little or no attempt to minimize overall length. The resulting length of 750 meters is grossly excessive; it can and should be reduced to less than 400 meters. A shorter layout for the interlocking would dramatically reduce route conflict duration--by fully one third compared to the current design--even if it requires the use of #10 turnouts and more turnouts and crossovers in the curved portion of the station throat, where the design speed limit is just 22 mph. Why not take advantage of this tight speed restriction to do the dirty business of routing trains to the correct track? This solution isn't obvious to American designers because it requires the use of non-standard track elements that may be considered exotic under typical U.S. freight rail AREMA standards, such as slip switches, curved turnouts and curved crossovers. Indeed, this prejudice explains why the curved crossovers in the DTX design are usable only in emergencies. While designing "by the book" is always a safe option, it is unfortunately not feasible to engineer a compact throat layout for Transbay using standard turnouts. Unlike the 100-ton coal hoppers with worn wheels anticipated by AREMA standards, this facility will only ever serve trains with very light axle loads, and maintained to the most exacting specifications. Much of the conservatism and design margin built into AREMA standards is completely unwarranted for Transbay, and inevitably leads to a mediocre layout. Transbay will be a special station, probably the most valuable piece of rail real estate west of the Mississippi. As an inherently constrained stub terminal, it demands excellence in design to achieve the highest possible capacity. While the current track layout may be deemed adequate for the blended Caltrain / HSR scenario planned for 2029, the twin failings of unnecessary route conflicts and excessive length will rapidly reveal themselves as fatal weaknesses when traffic demand increases or minor incidents throw timetables into disarray. Such entirely avoidable self-inflicted delays will cause excess traffic to be diverted to 4th & King, a terrible outcome for passengers as well as the economic vitality of the TTC and the city of San Francisco. Minor changes to the DTX track layout can address these failings.